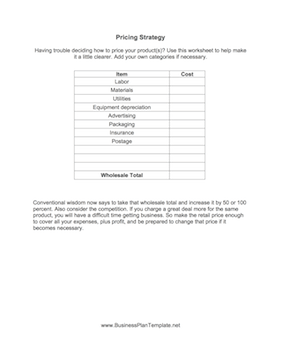 Use this Pricing Strategy form to help you calculate your costs in assigning a price to your products. Having trouble deciding how to price your product(s)? Use this worksheet to help make it a little clearer. Add your own categories if necessary. Conventional wisdom now says to take that wholesale total and increase it by 50 or 100 percent. Also consider the competition. If you charge a great deal more for the same product, you will have a difficult time getting business. So make the retail price enough to cover all your expenses, plus profit, and be prepared to change that price if it becomes necessary.